Have you ever tried PicMonkey? You can do so many fun things with your photos. I am no expert by any means, but I have been playing around with it trying to learn new things to create…like today’s burger for instance. The Santa Fe Burgers were first created many months ago when Mr. J my ex was upset because Red Robin no longer has his beloved burger….. I have never personally eaten one, so I went to their website looking to find out what was in it. Then I went into the kitchen and started creating. I have made this burger several times now, several different ways as you can see in this collage….. Cool right? Okay so I’m not as technologically savvy as the rest of you, but I am pretty impressed with the collage tool! The one on the left is the original that I made many months ago with the jalapeno slices and Pepper Jack cheese. The one in the middle is mine with the cheddar cheese and no veggies. I do not like my hot and cold foods together, yes I am strange that way. The one on the right is Alex’s burger with veggie cheese. What is veggie cheese. The sauce is the same each time, because I like the way it turned out…so why mess with it! The sauce and the burgers are flavored with canned chipotle peppers in adobo sauce…..
You dice them up and put them into the mayonnaise based sauce like so. I guess it’s kind of like a Adobo Aioli…..
Isn’t that fun? Now let me tell you about the heat with this burger. It is not a hot, spicy, turn your face red kind of heat. 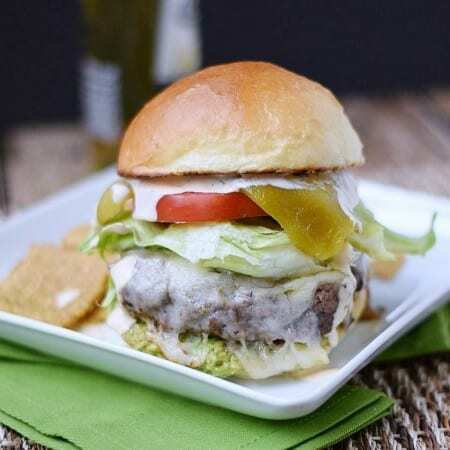 It is more of a lingering tingle in the back of your mouth, that lasts until you eat something that makes it go away 🙂 I do not like spicy foods, that is why I do not use Pepper Jack cheese, and I love this burger! 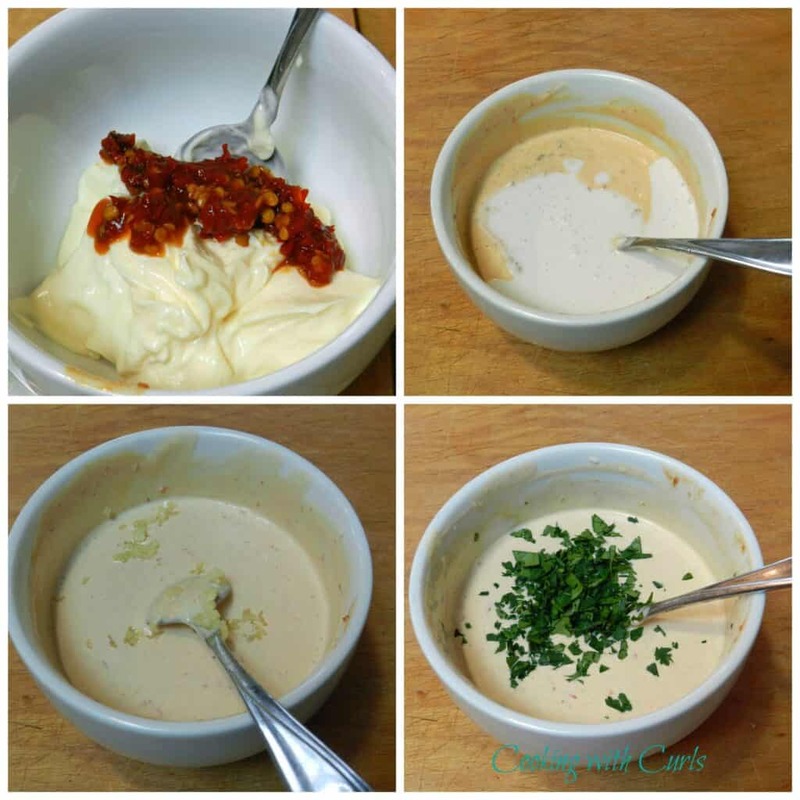 In a small bowl, mix together the mayonnaise, coconut milk, diced adobo peppers, garlic, and cilantro. Place in the refrigerator until ready to use. In a large bowl, mix together the ground beef, adobo sauce, salt, pepper, garlic, and cumin. I use my hands to mix everything together, since you now have to form 4 patties anyway. Making a small indentation in the center helps to keep them a bit flatter. Place in a large skillet and cook over medium heat. To reduce splattering and to make burgers juicer, cover pan with a lid. It also helps the cheese to melt. Add cheese after you flip the burgers over. Cook until no longer pink. Slice the buns in half, and toast on the grill. Spread guacamole on the bottom bun. Place burger on top of guacamole. If you did not add cheese while your burger was cooking, add it now. Add jalapeno slices, if using, lettuce, tomato and onion slices. Spread adobo sauce over the top bun. Place on top of burger and serve. Would you like to know why I always bake my own hamburger buns? Don’t you want to just grab one and eat it by itself? 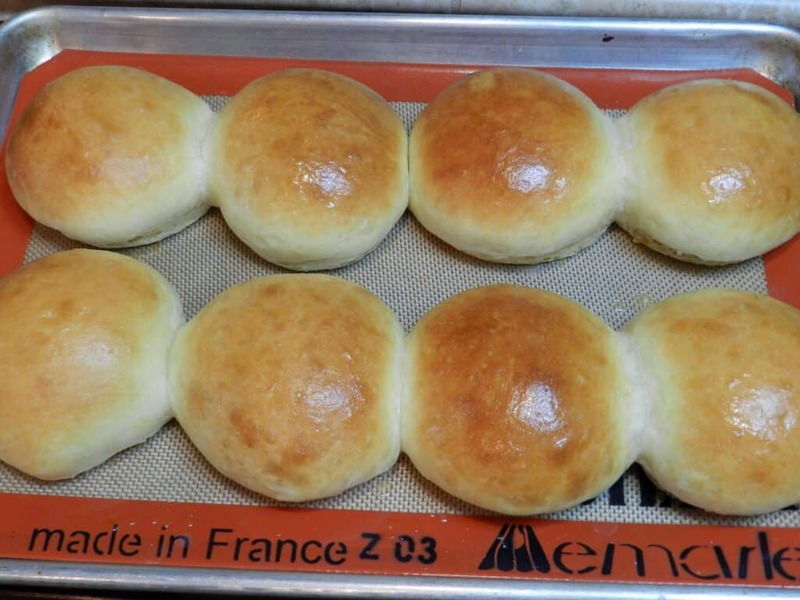 Here is the recipe for my super easy bread machine Homemade Hamburger Buns. 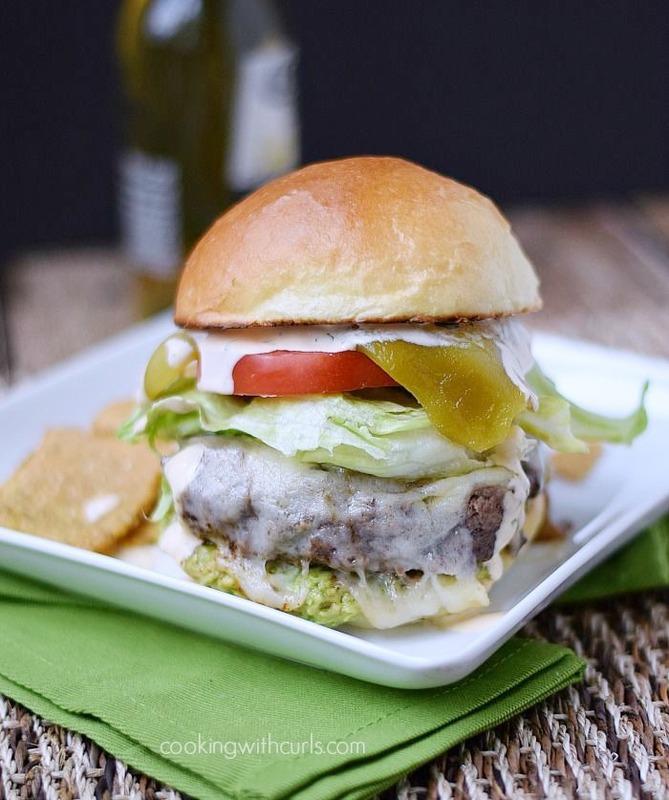 Santa Fe Burgers are topped with jalapenos, pepper jack cheese, guacamole, and a delicious adobo sauce that takes these burgers over the top!! Slice your buns in half, and toast on the grill. Spread guacamole on the bottom bun. Place burger on top of guacamole. 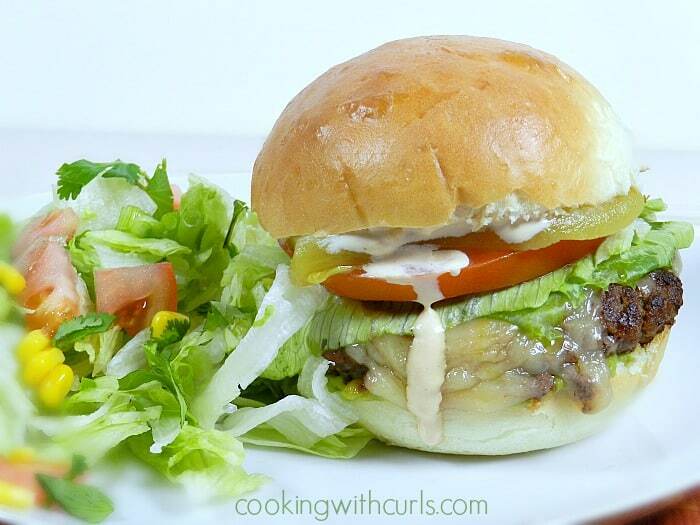 If you did not add cheese while your burger was cooking, add it now. Spread adobo sauce over the top bun. Place on top of burger and serve. The adobo sauce is not burn your mouth spicy/hot. It is more of a lingering tingle at the back of your mouth. My burger buns are always so DENSE when I make them. I’ll have to try your recipe. And I looove a good spicy burger, bring on the chipotle mayo!! Every iteration looks pretty good to me. I use PicMonkey a lot trying to compensate for my poor photography skills. I am getting better (sometimes) but it SURE does help a lot! Thanks for sharing at the Burger Bash! Pinning.